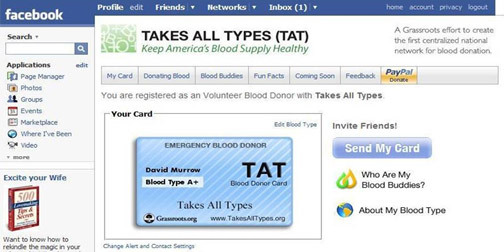 Takes All Types is leveraging the power of Facebook to help with blood donations. It's a Facebook application with a purpose. Users register their blood type with Takes All Types and then notifications are sent to them when blood is needed in their areas. This is one of the smartest Facebook apps I've seen. It's raising awareness and building a blood donation network by using the enormous force of a social network. If you are not a Facebook member, you can still register with Takes All Types to receive phone, text, email or fax alerts of blood shortages in your area.